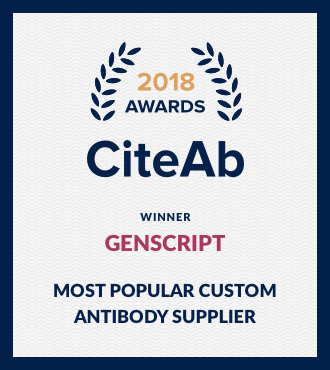 GenScript - The 2018 award winner for CiteAb's "Most Popular Custom Antibody Supplier"
This award recognises GenScript as the company with custom antiobdies cited more than any other. From the data generated through CiteAb we are able to gain a really clear picture of the way antibodies are used around the world. We can tell which countries are investing most in research using antibodies, which companies are seeing growth or decline, which antibodies are most successful and which areas of research are seeing growth. Genscript won in 4 categories – Quality, Productivity, Innovation, and Reliability - of 2014 CRO Leadership Award from Life Science Leader magazine. The awards are based on a survey of 10,000 pharm and biopharm managers measuring perception of CROs in 5 categories. The customers picked GenScript as one of the winners. “At Life Science Leader, we think having data-driven awards is more objective and valuable than having those awarded as a result of a nomination and voting process. The winners should be proud of these awards because they were determined by data gathered from customers,” - Rob Wright, Editor in Chief, Life Science Leader.